One rail-mounted Loader of 1000 tons/hour, receiving grain from a quay conveyor via a bucket elevator. One Loader on rails with cable reeling drums, 26-meter rotative boom with conveyor and telescopic pipes, 3 dedusting automatic filters, control cabin. Capacity up to 600 tons/hour (cereals). A ship loader is especially designed and constructed for the loading and unloading of bulk carriers. NauticExpo offers a great variety of ship loaders including radial, rail-mounted and wheeled. 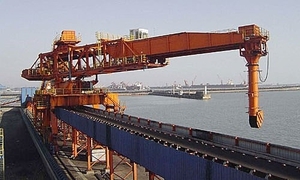 These devices handle only solid bulk cargoes at specialized terminals. Loaders differ in design. However, the great majority consist of a tower that pivots on its base and is equipped with a telescopic boom . A conveyor and a telescopic chute with a deflector at the end of the boom allows cargo to be loaded into a ship's holds. Choice will depend on the machine's loading/unloading rate, its range of motion and the possibility of rail mounting.